As some of you may already know, I have been trying to get an acupuncture clinic going for veterans and their families. It’s taken months to work out details, but it’s going to go now! Some basic information on this type of clinic. It’s a volunteer-run, free acupuncture clinic, called an MSRP (Military Stress Recovery Project) clinic dedicated to assisting veterans and active duty personnel and their families. Our clinic site and sponsor is DryHootch, a coffee shop owned by veterans, for veterans, located at 1030 E.Brady Street, Milwaukee, WI 53202. 414-763-2785. Start up date is February 21, 2012. The plan now is to treat the veterans/volunteers that work there, to let them know how acupuncture works, and to get a clinic flow going, etc. At some point soon we will open officially. This is a clinic based on donations and we welcome any assistance/skills/time you may wish to offer, it would be greatly appreciated. Also, please pass this email on to anyone you think may be interested. Thanks so much! P.S. : If you wish to donate monetarily to assist our military personnel, you can do this directly to DryHootch, to Acupuncturists without Borders, or to me personally for this particular clinic. Let me know if you would like further email follow-ups/information on the clinic. Don’t forget, you are welcome anytime at DryHootch for coffee and conversation. Maybe some bakery too! 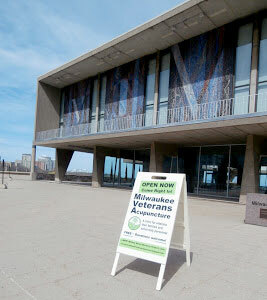 As of 2013, Chris and the MVA Project has a new home at the Milwaukee County War Memorial Center, and a new blog and full web-presence maintained by Jude. As Dusty puts it, he's "taking the fear out of acupuncture one video at a time..." Here Dusty shares screen time with Chris and intake person Marion/Mom.